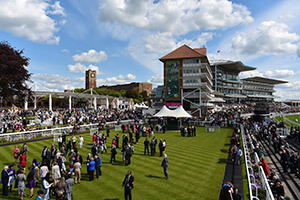 Arrive in style, with no delays to enjoy quality racing and fabulous fashions at the “Ascot of the North”. Don’t lift a finger if you want to fly to York Racecourse this August. Atlas Helicopters’ friendly Operations Team will arrange everything for you to VIP standards. Depart from a convenient location and with our luxury fleet of twin engine aircraft you can return at any time you like, even at night. For an instant price estimate use the Quote Generator below or telephone and they can organise your whole itinerary. 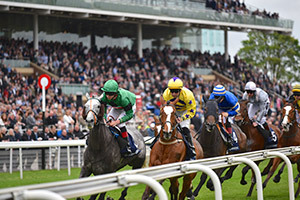 The Ebor Festival has become renowned for offering high-class racing, with ‘The Knavesmire’ for many years voted “Northern Racecourse of the Year” as well as being the jockeys’ favourite. It’s the quality racing and fabulous fashions that make the Ebor Festival the “Ascot of the North”. Recently, Purple Moon went on from the Ebor Festival to almost becoming the first British-trained winner of the Melbourne Cup. Other famous runners include Frankel in 2012, showing the high calibre of entrants at this event. Choose from any of the four days, or stay for the entire Ebor Festival and your helicopter itinerary will revolve around your plans. You can avoid the queues and resulting traffic congestion with a flight directly to the course. Call the Atlas Operations Team to arrange your flight plan today on 01256 635000 or get an instant estimate with the form below. Catch up with horse racing friends during the Opening Day, enjoy the fashions on Ladies Day and begin the build up to the excitement of Saturday’s main race. 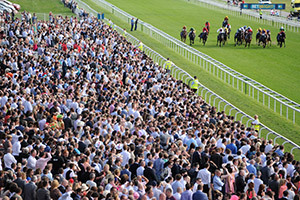 The top horses and jockeys are attracted to this event, which is seen as the highlight of the second half of the flat season in the horse racing calendar. Make the most of your time at the Ebor Festival by flying there in style. You’ll have complimentary champagne, light catering and a copy of the Racing Post, helping you arrive informed and in a sparkling mood, ready for a feast of racing. To find out more about flying to the Ebor Festival, please call our team today on 01256 635000 or get an instant estimate with the form below.